I wasn’t sure what to expect, going to a hotel where everyone is quiet and walks around in bathrobes and slippers. Anytime I go on a mini-vacay, I am loud as hell and feel the need to walk around dressed to the nines in Stiller’s heels. I knew the hotel was absolutely stunning, but would I feel comfortable? Absolutely! I felt like the best, quiet version of myself and I want to go back every year! The hotel was beautiful. As soon as you walk in, you feel relaxed and comfortable. Almost like you’re at home. There is a welcoming sitting area and you see nothing but beautiful scenery outside every window. The views alone are reason enough to stay at this enchanting hotel. The staff was delightful. The Post Hotel staff were “quiet amazing!” Haha, get it? Their gentle but endearing welcome, their helpfulness and service was a ten out of ten! Bathrobes and slippers. I have never, in a million years, thought I would walk around a hotel in just a bathrobe and slippers and feel comfortable. I almost think it became my favorite part of the entire stay! No worries about what to wear and who was watching… literally everyone was in a bathrobe during breakfast, lunch and dessert! It was the best! The pool area. This was by far my heaven on Earth; the Post Hotel’s indoor/outdoor infinity pool with VIEWS FOR DAYS! Indoor and outdoor hot tubs, steam rooms, a eucalyptus room, lavender room and the coolest shower where you could pretend you were in a tropic rain forest! Let me not forget the “nap room,” equipped with beds, pillows, and of course VIEWS! I could have stayed there all day! The Spa. I had a delightful Swedish massage at the spa and I think I was snoring at one point! Exploring Leavenworth. The Post Hotel does not serve dinner, which gives you a chance to get out and explore! We snowboarded during the afternoon and grabbed a bite to eat at “South,” which serves Mexican cuisine and it was delicious! 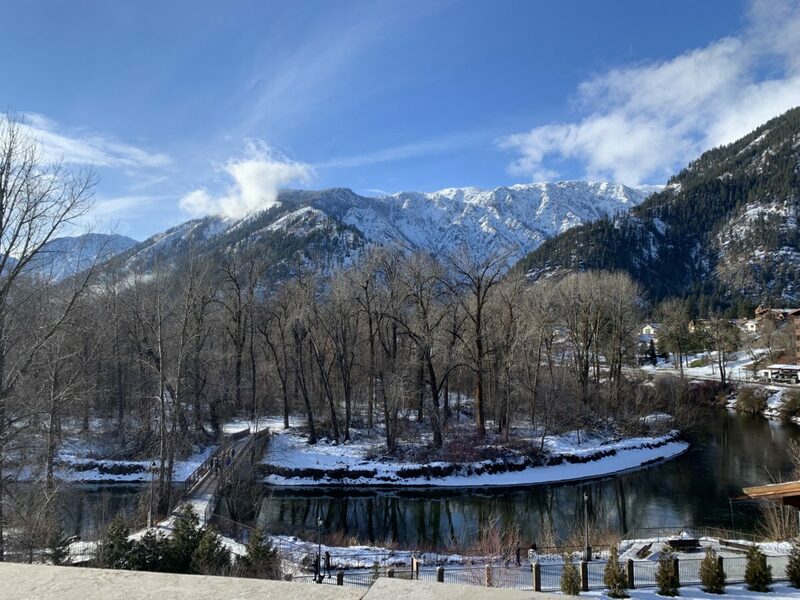 I truly enjoyed my stay at the Post Hotel in Leavenworth and I HIGHLY recommend it! Whether you’re celebrating an occasion, or just ready for a little getaway, you won’t be disappointed! PS: Did I mention it is an 18 and up resort?! Enough said! Book a room and have some quiet, relaxing, kid-free fun! Visit Post Hotel’s website here!